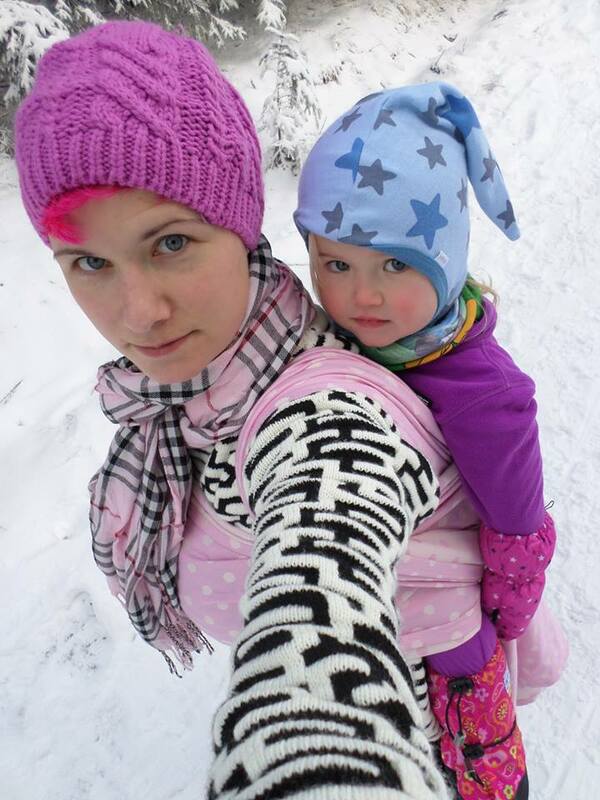 I love babywearing in winter, enjoying the nature, maybe even some snow, with a sleeping child in my wrap or carrier. Here are some tips on 'how to survive the cold'! An airy, thin wrap is great for hotter temperatures, but might also mean is doesn't help to keep your child warm when it's getting colder outside. I love wraps with wool (or cashmere, alpaca or merino wool), they regulate the temperature and are cozy & warm when it's cold outside. 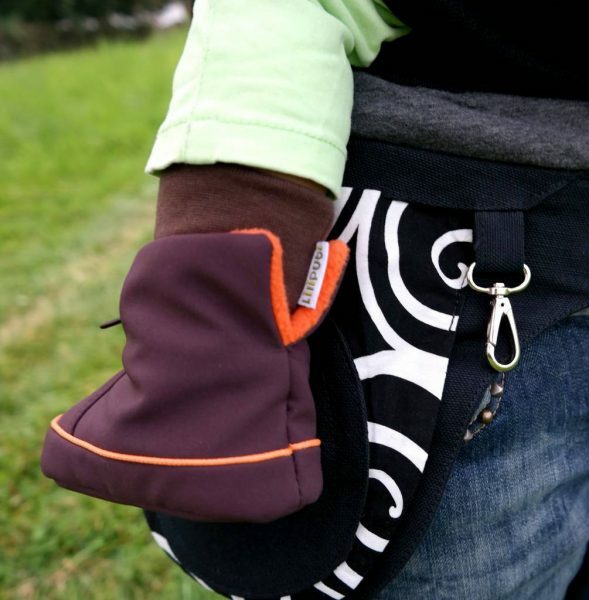 Offcourse you can use your cotton wrap too, there's no need to buy a wool wrap for the winter if you don't own one. You can wear your child in a multilayer carry which provides more warmth. 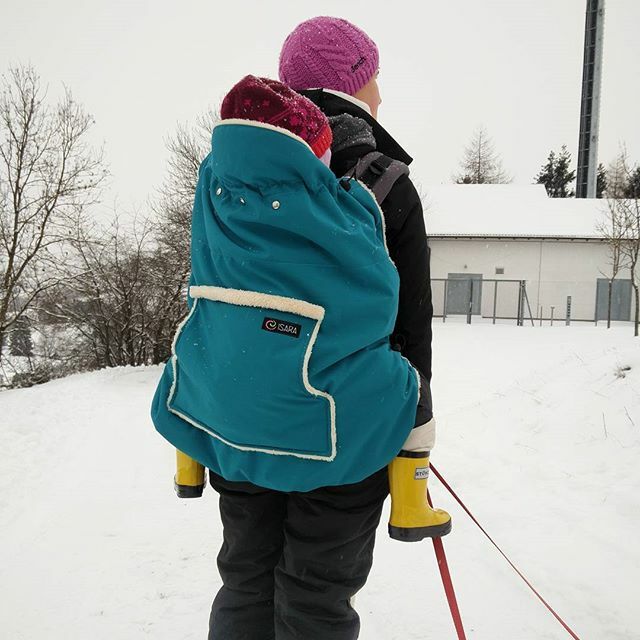 There are great babywearing covers available to make your carrier winterproof if you don't have a babywearing coat. Don't overdress your child. Your body provides some heat and especially when you're wearing your child underneath your (babywearing) coat it's mostly not necessary to put a thick coat on your child. Babybooties: the outside mostly has a wind and waterproof surface, some booties have a soft inner lining or offer separate liners for colder days. There are also lambskin, leather or wool booties available. Legwarmers: fun, cute, warm! A great way to keep your child's legs warm and you could also put them on the arms if you have an 'arms out' child. Some brands offer (merino) wool legwarmers, my favorites! Shoe covers: if your child is already walking, these covers will keep the mud away from your clothing if they suddenly want to go in the wrap after running through the mud or snow. 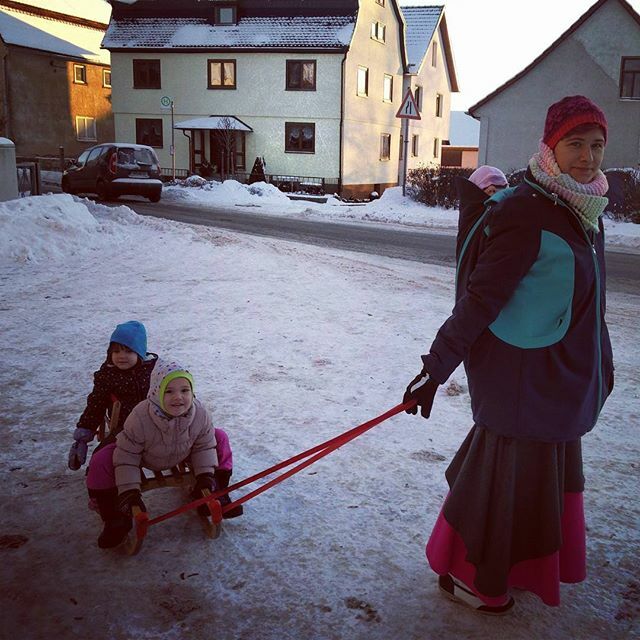 Tights: wearing tights is an easy way to keep your childs feet/legs warm in the winter. It's not only for girls, there are some very boyish designs out there too I would recommend getting some wool tights for freezing cold days. They regulate the temperature, no sweat when it's warm inside. Socks: Again: wool! Sometimes you will come home after a long walk and notice that your child has cold feet, eventhough he/she was wearing socks/tights and babybooties..... It could mean that your child was sweating and that's the reason for the cold feet. Wool will offer warmth without sweating. You can ask your grandma to knit some socks, buy them at the Christmas markets (my fave!) or buy them online. Overall: You will need this if your child might end up walking instead of being worn once you go outside. I hate bulky snowsuits or wintercoats in the wrap/carrier. 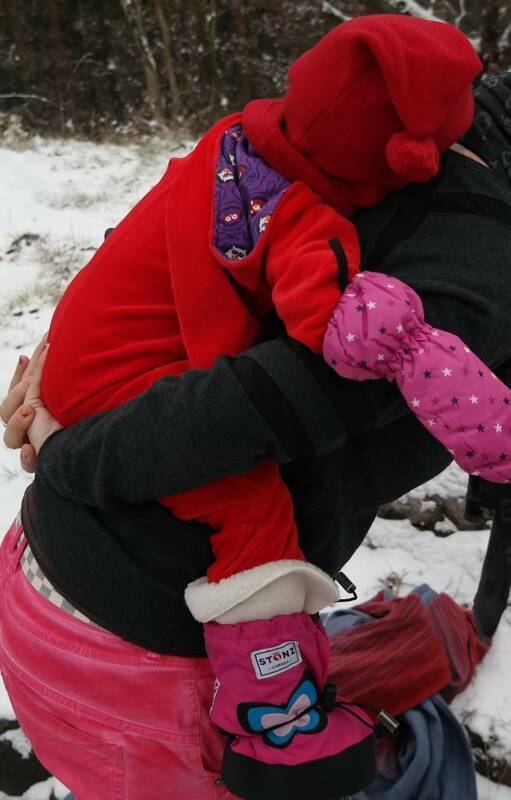 If bulky snowsuits get compressed they also don't keep as warm very well. A wool or (wool)fleece overall is great! 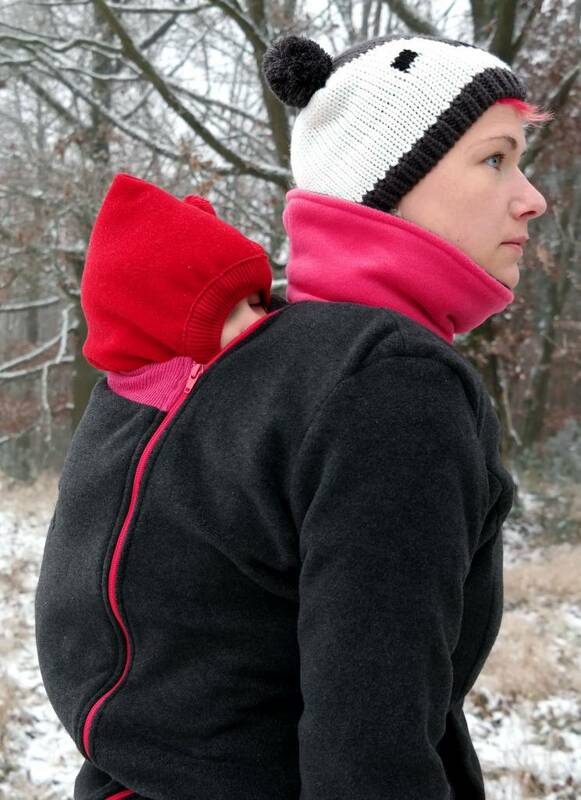 If you don't have a babywearing coat/cover and you're wearing a tiny newborn you might want to use a wooloverall too. There are some models available who even cover the feet and hands so you don't need mittens or booties. A wool underlayer: I'm a huge wool fan. Wool-socks or even better : wool-tights are great! My little girl wears a woolbody too. 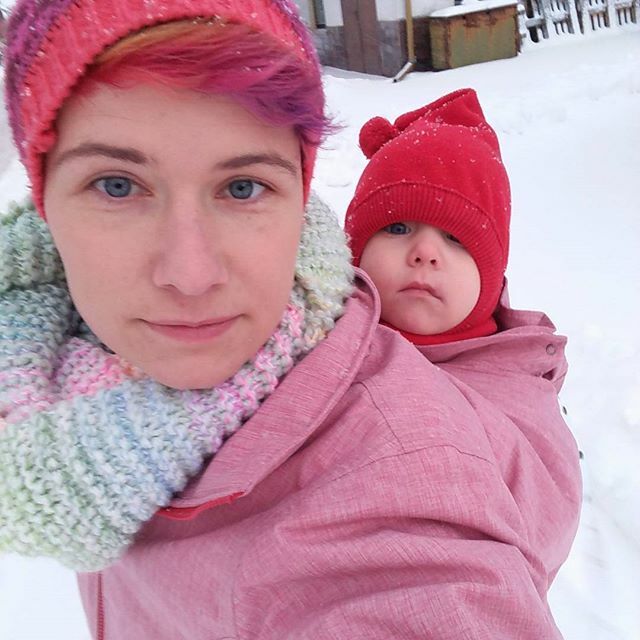 I just put a normal jumpsuit or pants & longsleeve over her wool underlayer and this way she won't sweat when she's inside and won't get cold underneath my babywearing coat. Don't be afraid for wool, you can wash most brands on the wool program nowadays. There are some very affordable brands around, or just look for second hand clothing if you prefer so. Mittens: I put these on my children when it's freezing and I'm wearing over my coat. 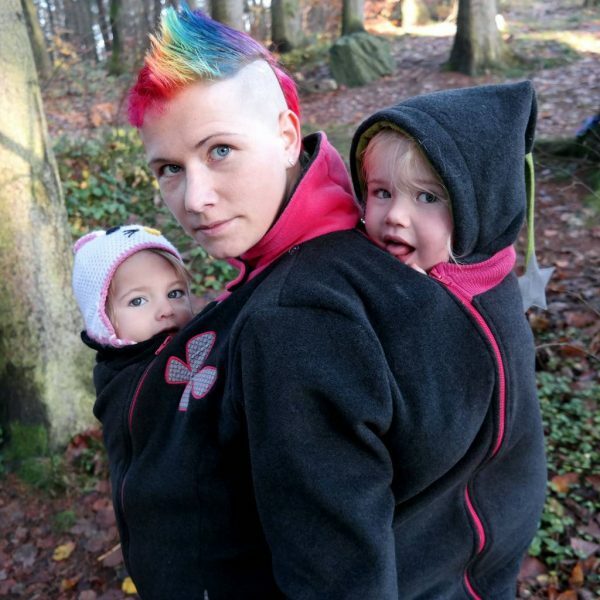 If they are underneath a babywearing coat it's mostly not necesarry. This really depends on your situation. 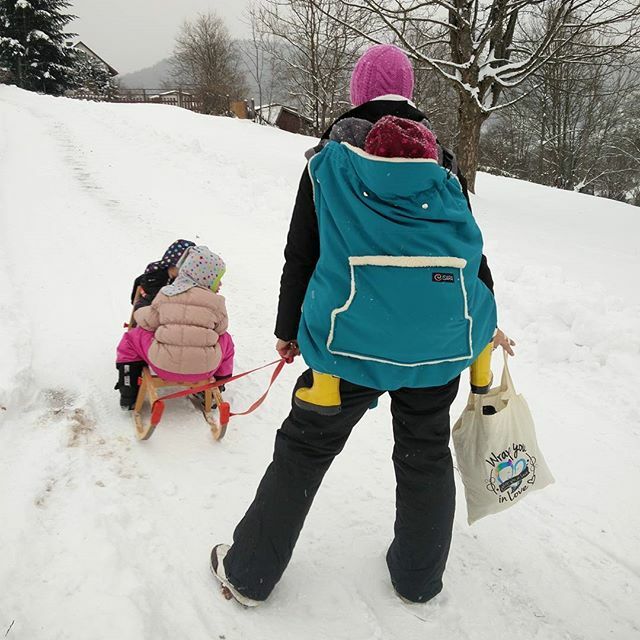 Do you think your child will end up walking half way or will you be wearing your baby for a 2 hour nap? Will you spend those 2 hours outside or only go outside for a short walk and back inside once your child is asleep? A wool underlayer: Yes, even I will wear a merino longsleeve. You can wear it instead of your normal longsleeve, but I prefer to wear it underneath another longsleeve. It's so soft & a great way to keep yourself warm without sweating. With wearing a longsleeve & hoodie over my merino longsleeve I mostly don't even need a coat! 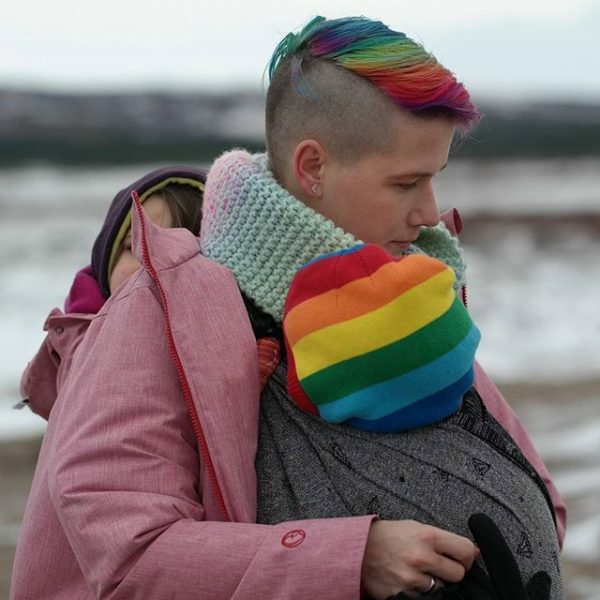 A normal coat: If you don't want to buy/wear a babywearing coat (for whatever reason), picking the right coat is very important. If you're wearing your child on your back, over your coat, you want it to provide some grip. I hate it when a wrap keeps slipping from my shoulders. A bulky, padded, wintercoat makes wrapping even harder. I own a Bench coat, with wool. Not thick, not slippery, thumbs holes! You might also want to look at the hood. I prefer a coat without a hood, or with a detachable hood. With backwrapping a hoodie can be in the way. 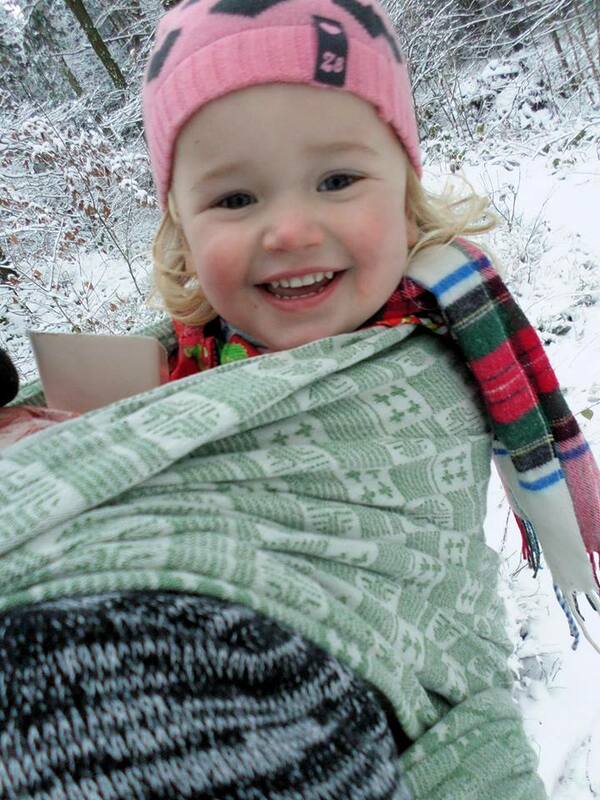 If you're still wearing your child in the front, it might be easier to wrap your child underneath your coat. 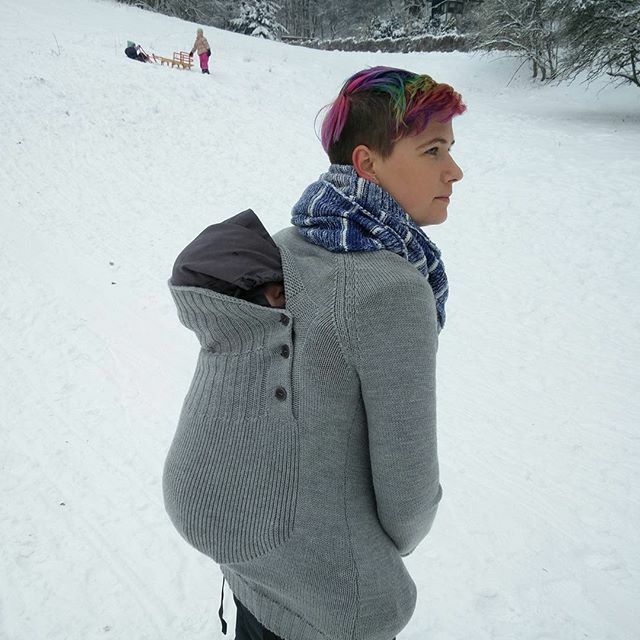 It doesn't need to be a babywearing coat to offer enough room for your newborn. Some mama's even borrow their husband's coat. Great idea The best thing about wearing underneath your coat is that you can put your coat off when you're inside and you can leave your child in the wrap when he/she's asleep. Hat: don't forget to wear a hat! a scarf & gloves might be nice too, if it's really cold. 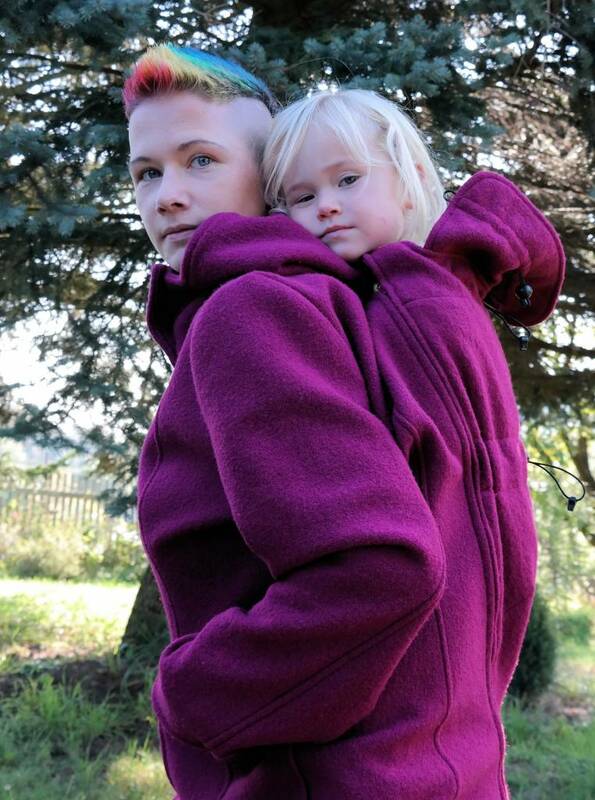 Babywearing coat: The easiest way to keep your child & yourself warm. Not the best choice if you have a toddler who wants to go up/down but great for a not-walking baby. There are many brands around, with different features. 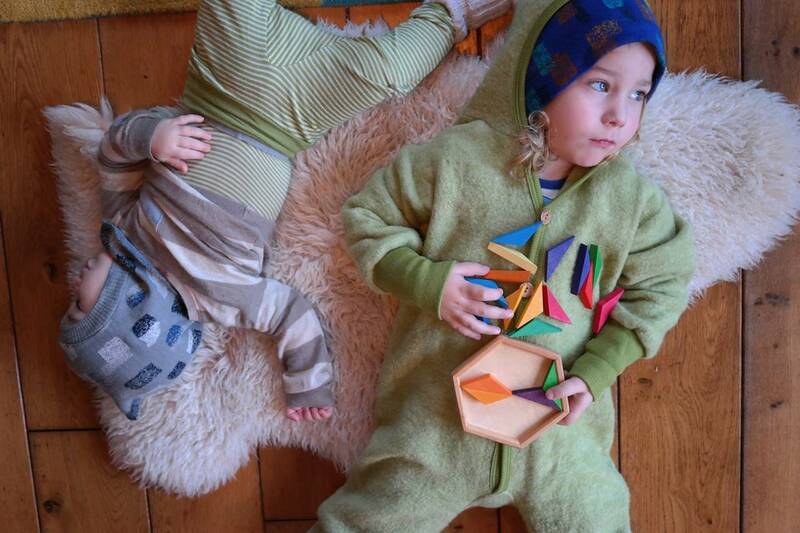 Find out what's important for you, for example: hoodie for the baby & you? using it for a frontcarry only? or for a backcarry too? or even a hipcarry? Do you prefer wool or softshell? What do you want to spend? 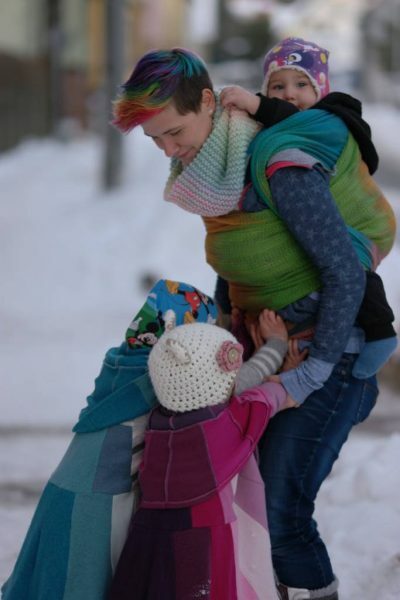 Babywearing poncho: Quick and stylish. Easy to use with and without your child. 1. The perfect hat. Balaclava, with wool, fleece or wollfleece. !!! !!!! Always make sure your child airflow is free. If you're wearing a scarf, or your child is wearing a scarf, please check that they can breathe without any obstacles. Do you have anything to add? 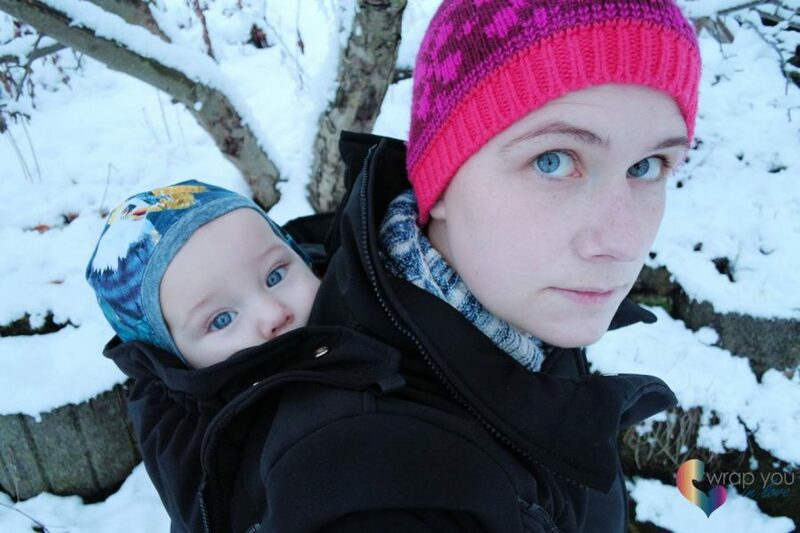 Just contact me, so I can add your babywearing tips or favourite brands!